Those of us who live on National call ourselves "Nationalites" for most of the homes on National are old -- far older than Linderhof. It was originally the highway and was paved in brick as most streets were in our little town. The brick is still there, on National, under the asphalt. A neighbor, Sally, who lives on the corner two blocks down has a great Victorian - a real painted lady (which I've featured in a post). We've visited but I've never had her over for tea so one Friday, I invited her for a cup of tea and a nosh. She's wanted to see the garden -- and because of my summer surgeries it had to be at it's worst!!! But Sally is a visionary and can see past weeds and chores that need to be done to see the garden as it should be. Tea in the breakfast room, of course. And with my blue and white, of course! The very very last of the marigolds brought in just before the frost in a blue and white pitcher. The Spode blue room teapot, cups and saucers and tea plates. One of my favorite tea cloths on the table, freshly ironed tea napkins and my mother of pearl forks. And the nosh -- a favorite for this time of the year -- pumpkin cranberry coffeecake -- even though it was afternoon and not morning and we were having tea and not coffee!!! 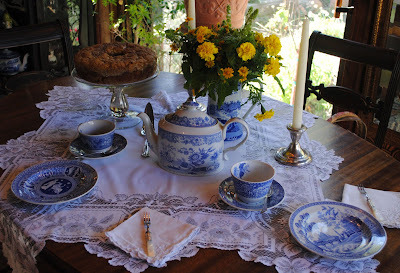 Sally and I visited and ate and drank cups and cups of freshly brewed tea. A French orange tea which went very well with the pumpkin cranberry coffeecake. The afternoon ended all too shortly and soon Sally was saying goodbye. She did gift me with a sweet tea bag holder so I'll always have a memory of this afternoon. Even though named "coffee" cake it goes well with afternoon tea and it is two of my favorite fall flavors -- pumpkin and cranberry. I've made hundreds of these and I always bake them in the tube pan. I suppose one could bake them in little loaves but I never have. I like the look of the coffeecake on one of my glass cake stands. I think it's impressive. The recipe from a long ago Victoria magazine. Cut and saved and baked over and over and over again. It goes well with breakfast Thanksgiving weekend when the house is full of company. Preheat the oven to 350. Butter an 8 cup ring mold or other decorative mold. Dust the pan with flour, shaking out the excess. In a large bowl, stir together the flour, pumpkin-pie spice, baking soda and salt. In the medium size bowl of an electric mixer, at medium speed, beat the eggs until they are foamy. Beat in the granulated sugar, pumpkin puree, and oil until well blended. Add the pumpkin mixture to the flour mixture and stir just until a batter forms. (Do not overmix). Gently fold in the cranberries. Spread the batter evenly in the prepared pan and place on a baking sheet. Bake for 50 minutes, or until a toothpick inserted in the center comes out clean. Let the cake cool in the pan on a rack for 10 minutes. Run a thin metal spatula around the edge of the mold to loosen the cake and turn the cake out onto the rack to cool completely. Sprnkle the cake with granulated sugar before serving. I am new to the blog world and just started my blog, http://moderncountrylady.blogspot.com Have a look if you have the time !! !Happy baking !! This is just beautiful The coffee cake sounds wonderful. What an enchanting afternoon. Your table looks beautiful. Love the blue and white, and the cake looks even better! Thanks for sharing. That sounds great! I just printed off the recipe!! Yummy! Oh yum ... lucky Sally! I love the mix & match of blue and white on your table; I double enlarged each picture to get a good look. And does this cake freeze well? I'll have a batch of young and hungry houseguests over Thanksgiving (as many as 7), and I think this might come in handy at breakfast time. I like the look of the recipe -- love cranberry recipes that don't call for orange peel. Not a big orange peel fan. But pumpkin? Yumm... sounds delicious! Your table is "Scrumptious"!!! I love every detail and your linens are PERFECT! NOW let me copy that recipe because that is definitely a recipe I WILL Make!!! Love it! and thank you so much for sharing all these goodies with us! As always, your table is beautiful - who wouldn't be thrilled to be invited for tea and cake at Linderhof?! 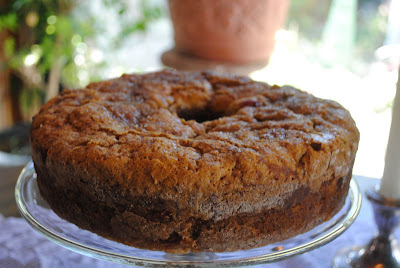 I love the sound of the Cranberry and Pumpkin Cake and will try it this week. I have the better part of a large can of puree and it will do perfectly. Simply lovely! I love your blue and white! Ah the linens are just lovely! The cake looks and sounds divine! Thanks for adding the recipe! Hope your feeling better, I can relate to the weeds in the garden! Thank you for joining me again for Tea Time! Your table is always inviting! What a treat for me to have stopped by tonight. Not only did I get to feast upon that beautiful table setting complete with gorgoues dishes, but I also found your great coffee cake recipe! Thank you so much for sharing with us. Sounds divine for this time of year. What a pretty, pretty table! I am so in love with blue and white! 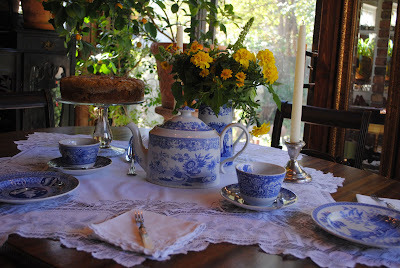 http://sandimyyellowdoor.blogspot.com/ for Tea Time Tuesday. your tea table looks lovely with the adorable teaset and this wonderfull tea cloth and napkins. I can imagine how special your neighbor Sally felt with this nice table and the yummy coffeecake. I will try to make it because we have normally lots of pumpkins and this is a very different recipe. Thank you for sharing all the nice photos and the recipe. Tea at your Linderhof is always a special occasion! I want to eat a slice of that cake. What a delicious looking cake! Thanks for sharing about your sweet afternoon.